This is a road which I was walk to the school every day. 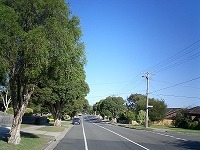 Basically there is space of lawn and the trees were planted beside the road in Australia. Australian roadway is so huge! Usual Australian house has big garden and designed one storied house. It seems like an American style houses. It’s made of woods, different from Europe houses made by stones. 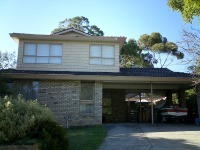 This is a house which I stayed while I was in Melbourne. 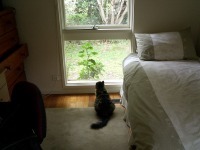 I’ve never had a pet before, so I was really enjoyed while I’m staying this home. 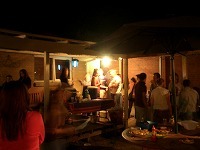 I went Home party with my friends who I became close while I was in the school. It was like a really home party I’ve seen in American movie, and there is juke box in the garden and everybody danced a lot. 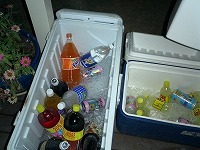 Every drink were for free, so I could enjoy party very much! 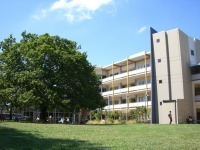 This is the building which I studied every day. Picture on the right hand side is the inside of the studying room. This exchange program is supported by each university, so I went there with 11 students from same my University. 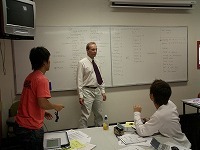 Mr. John who was belonged to the Australian air force, lectured us very strictly. ( just kidding, he was really kind guy). 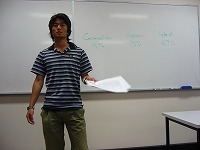 He started teaching with basic English level, so we can learn gradually and I could grow up my English skills. 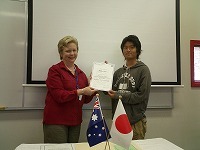 At last day, we had presentation about “our majoring course in university” and “what can we do with it in the future?”. I studied about LSI designing in my university, so I presented about Hybrid car and recent royal car has a massive amount of LSIs in it, and that trend will increase in the future. Then finally I graduated (right hand side). This study abroad experience was filled by the full of knowledge and valuable experiences. I met many kind peoples, had some culture shock from many events and that was causes me to grow up one more time. If I have chance to visit Australia again, I wanna come back Melbourne again!